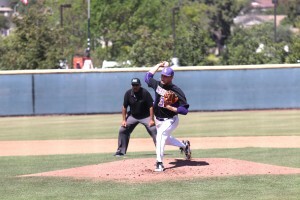 In game three of the series, sophomore pitcher Scott Roberts gave up 3 runs and struck out four batters. The California Lutheran University baseball team finally broke their six-game losing streak in a three-game series against Linfield College April 12-13. After a 5-2 loss on April 12, the Kingsmen made a comeback in games two and three, beating the Wildcats 25-0 and 9-3 respectively. Game two of the series was a blowout with 14 Kingsmen getting across the plate and 10 notching RBIs. One of their largest victories to date, the Kingsmen claimed a season record of 25 runs on 22 hits. Head Coach Marty Slimak said he wasn’t worried going into the game—he knows what the team is capable of. “I don’t think there was any kind of panic, but we knew we had to win these games to get us back,” Slimak said. Sophomore outfielder Nick Rhoades led the team in runs with 4 runs and 1 RBI. Senior infielder Anthony Sidley, junior outfielder Ryan Probst and junior third baseman Ryne Yamashiro added 3 runs each, while eight Kingsmen tallied single runs. The scoring spree began in the bottom of the third with Sidley’s single to left-center sending junior outfielder Cortez Espinoza to home. By the bottom of the fifth, the Kingsmen led the Wildcats 15-0. The Kingsmen added 10 more runs in the sixth inning, bringing the final score to 25-0. The third and final game of the series was tied at 0-0 until Probst hit his second homer of the season in the bottom of the third. Yamashiro tallied another run on an error by the Wildcats, bringing the score to 2-0. In the next three innings, the Kingsmen and Wildcats went run-for-run until the Kingsmen pulled away with a sacrifice fly by first-year catcher Jalen Parks, an RBI by Espinoza, 2 RBIs by Tanner Wright and an RBI by Weston Clark. The game ended with a score of 9-3, bringing the Kingsmens’ overall record to 20-11 and conference record to 9-6. Now ranked No. 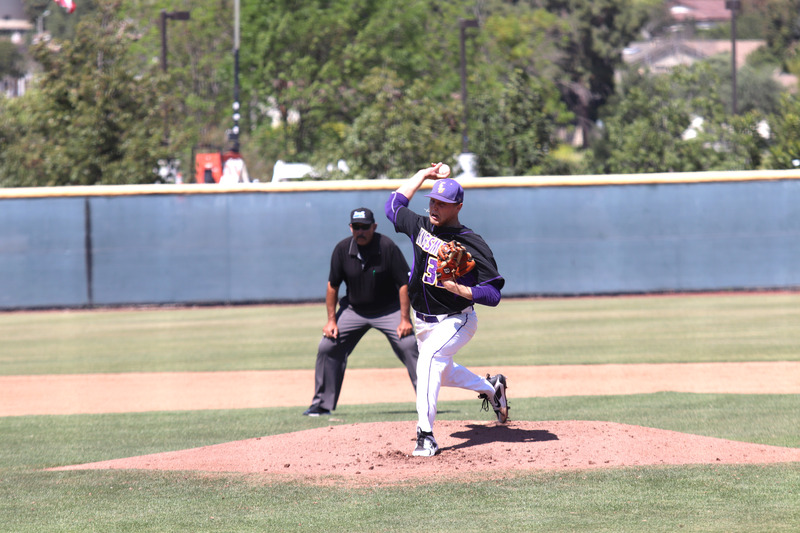 4 in the Southern California Intercollegiate Athletic Conference, the Kingsmen will head to the University of Redlands to face the Bulldogs April 19 at 3 p.m.